ChemWeb.com is now the largest online chemical community in the world. ChemWeb.com is a unique resource which combines a huge range of information for those in research chemistry, the chemicals industries and related disciplines. Membership is completely free. 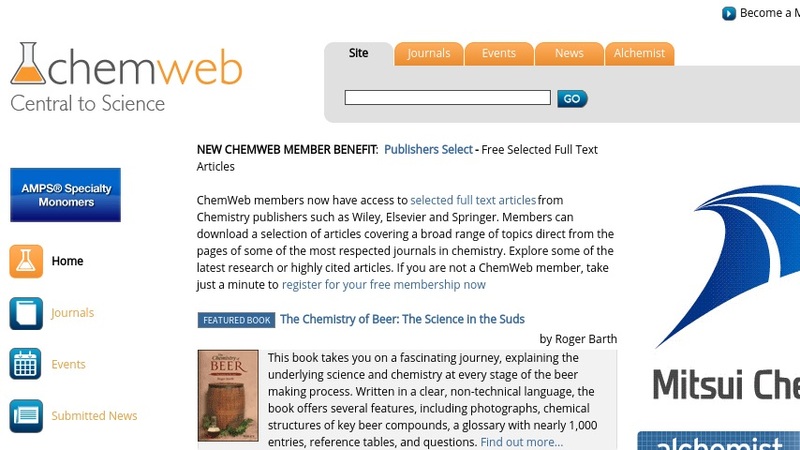 ChemWeb.com members can access over 350 journals and 15 databases from a variety of publishers. A number of databases offer structure-based searching and manipulation of molecular structures. ChemWeb.com services include the Careers Centre in association with sciencejobs.com, Conference Centre, Bookstore and the online magazine, the alchemist, as well as several specialist Subject Areas based around specific chemical fields. More information on ChemWeb can be found in the User Guide.